In my weekly column, we take a long look at impact fantasy football rookies. I compare their performance to date against my original expectations of them. Let’s continue this 2014 version of the series by looking at one of the best receivers in the 2014 NFL Draft class, Jordan Matthews. I will look at some of his college production against his performance versus Dallas to discern his dynasty value. Here are my thoughts after watching three games of his college play: At first glance, Matthews is a physical specimen at 6’ 2” 212 lbs., but plays larger than that. The receiver was the first player ever to ask for tape of his opponents after his Senior Bowl invite. It’s his work ethic and competitive nature that separates the wide out from the other talented receivers in his class, not his famous cousin Jerry Rice. By playing in a run heavy Vanderbilt offense, Matthews became an asset in the running game separating him from the rest of his class. The wide out fires out to his defender quickly, squares his shoulders, and uses his powerful legs to knock them back from the line of scrimmage. Matthews struggle a bit to get off the line when facing a defender in his face, this might cause him to play the slot at the next level. There are times the receiver has concentration lapses after he isn’t targeted in a while. Another deficiency of Matthews is that he matches his level of competition instead of rising above it. Consistency made his cousin great, so if Matthews wants to be anywhere close to that he needs to increase his intensity. Fluidity is not a strength of his as you can see some stiffness in his hips, but he still runs reverses using his quickness and leg strength. Vanderbilt featured him on some bubble screens where he can use his speed and explosiveness screaming down the sideline. He reads blockers well, finding lanes to run, while keeping an eye on downfield threats in the open field. Matthews does a great job selling each route the exact, same way with a good burst off the line. The receiver sells the defensive backs by using double and triple moves to create separation down the field. Matthews has good straight-line speed (4.46 40 time), but takes him some time to accelerate fully as he is a long strider. The receiver fully extends himself to catch the ball, and when his not so talented quarterback found him in stride, he torched the defense. The wide out tracks the ball well in the air and specializes in bucket catches near the sideline where only he could make the reception. Matthews makes sure he drags both feet to make the catch when near the sidelines. He has good concentration and makes receptions in the middle of the field, despite the extra contact. The wide out doesn’t create much separation so he uses his body to shield the smaller defensive backs from the ball and skies high above making the reception under tight coverage. The young receiver has an impressive catch radius that he shows off by adjusting to poorly thrown passes contorting his body around to get to the pigskin. He can adjust to errant throws, no ball seems too high or too low. Matthews can get physical slapping defenders away from his body or he using stiff-arms with the ball in his hands. It usually took two or three defenders to bring him down once he reaches his full stride. 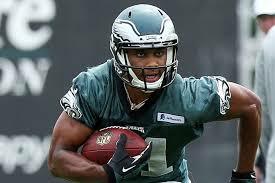 I see him more of a Marques Colston clone, bigger quick slot receiver who could excel in the right offense. Against the Cowboys on Thanksgiving: Matthews looks right at home in Chip Kelly’s offense. He earned his way onto the field at the beginning of the season and received at least four targets in every game so far. The wide out is an effective asset in the run game too. He squares his shoulders and takes on a safety or corner blocking downfield on runs. On pass plays if Matthews is not the target, the receiver uses his big body to knock defenders out of the way so his teammates can do more damage with the ball. Matthews plays in the slot mostly, usually getting a clean release off the line of scrimmage. He runs a lot of crossing patterns trying to create separation and confusion for the defense. The receiver still has a few concentration issues when he missed a Mark Sanchez pass at the back of the end zone that bounced off his hands. Despite that miss, the young wide out catches the ball in stride, out in front with outstretched hands, running crisp routes. Matthews catches the ball at its highest point and fights for the ball. He took advantage of Dallas’ decision to face him against linebacker coverage by getting behind the slow-footed defender and racing to the pylon for a first quarter touchdown. The rookie receiver appears to have better chemistry with Sanchez than Nick Foles. It certainly helps the young wide out that defenses need to concentrate on Jeremy Maclin and LeSean McCoy before they worry about him. In this offense, Matthews is a strong WR2 with Sanchez at the helm; however, since he is a free agent and Foles might be back at quarterback next season, I would only consider the rookie as a dynasty WR3 at this time. Also Maclin is a free agent after this season, so the best coverage might roll to Matthews way next season. Do you like what you are reading? Do you want extra insight at the Senior Bowl? Make sure you donate using my PayPal button to make sure I attend this year’s Senior Bowl Game and the week of practice before the game. Make sure you follow me on Twitter @AndrewMiley or the site @Dynasty_Blitz.